Need more stars?? 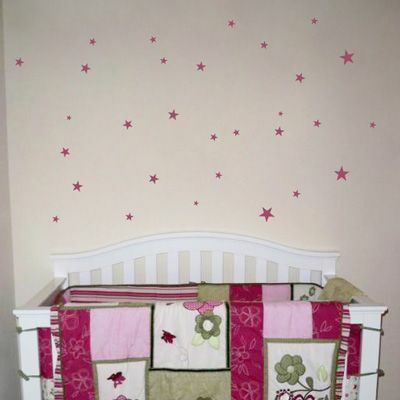 This set of 50 star wall decals is shown here in our matte raspberry but available in the color of your choice! You will receive 50 star stickers ranging in size from 1 inch to 3 inches to place however you like! Please note: Only 30 stars are showing in this listing! I just wanted to send a quick note to THANK YOU for my order, and for being such a wonderful company!! I’m attaching a picture of my decal (“Everything happens for a Reason”) [see www.facebook.com/DaliDecals for more customer photos!] which I put above my bed to remind me that everything I endure has a purpose. I was also THRILLED to get a bonus second set of the Cute Little Birds with my order!! My mother came down to visit me for the weekend (a 7-hour drive), to help me set up my new apartment, and I gave her the extra birds. She loves them as much as I do! Thank you, Dali Decals, for making great products and for brightening our day!